The need to safeguard and backup critical company data is of paramount importance for today’s businesses. An onsite storage device using QNAP Network Attached Storage (NAS) is a good and cost-effective method to protect your business data as it ensures data backup and centralized storage. Using IDrive online backup to protect your QNAP NAS device provides the protection you need, to keep your business running in case of a disaster. A backup strategy with both onsite and offsite backup capabilities can enhance your disaster recovery plans by manifolds. The QNAP Backup App works impeccably with your QNAP NAS device to provide a reliable online backup solution which is fast and affordable. Backup your NAS device to IDrive and profit from an online storage and backup solution which is economical, secure and high-performing. 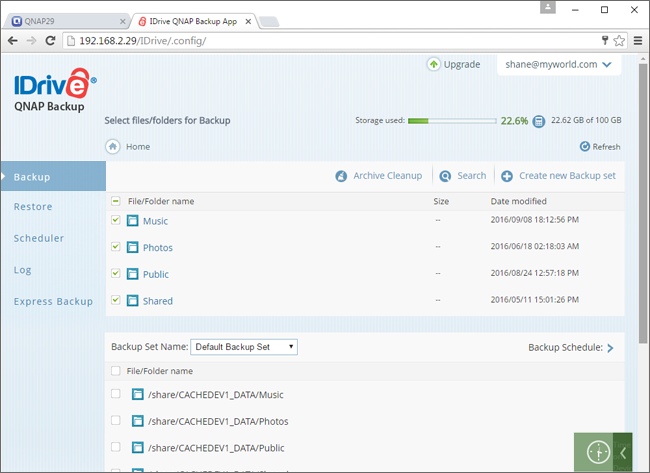 With the QNAP Backup App, you can schedule automatic backup jobs, perform manual backups and restores, receive email notifications on completion of all scheduled backup operations and also view log details. 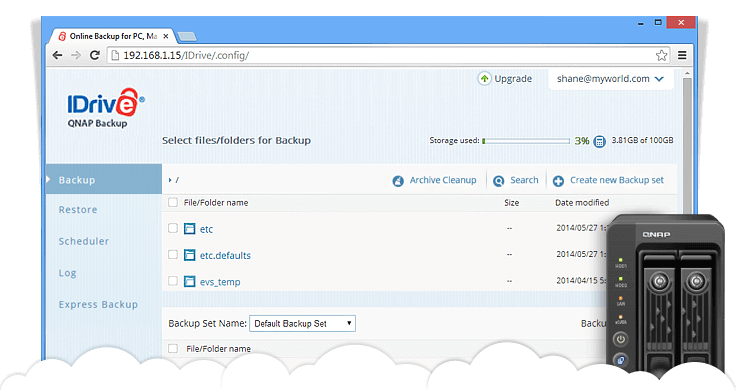 Create multiple backup sets for customized backup. Step 1: Identify the correct IDrive App package for your model. Login to your Qnap NAS. Go to the App Center > Backup/Sync. Click the IDrive package Icon. 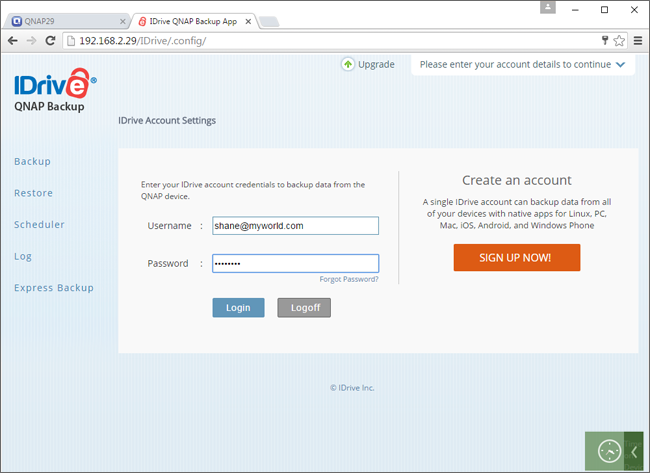 A popup window for IDrive package appears. Click the 'download' link. 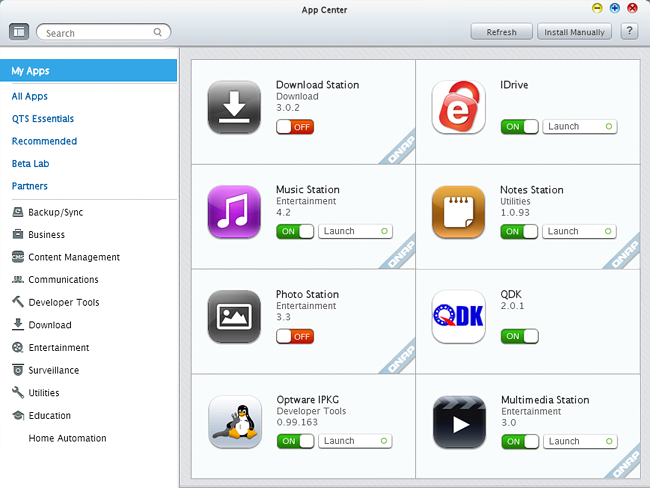 It will download the App center's package of IDrive App for your QNAP model. 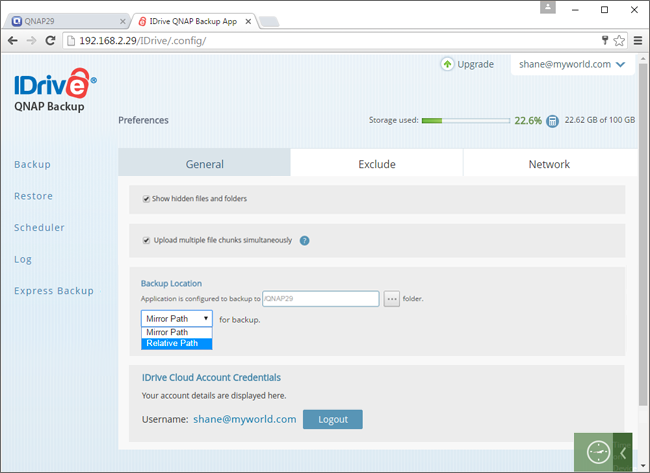 Enable Web services and File station on your NAS device prior to the QNAP Backup App installation. Navigate to Control Panel > Applications > Web Server. Select the Enable Web Server check box. Click Apply All to save the changes. Navigate to Control Panel > Applications > Station Manager > File Station. Select the Enable File Station check box. Login to your QNAP NAS device as admin. Click the Search icon and search for IDrive. Click the IDrive Thumbnail from the search list. Click Install. After installation, the IDrive App will be listed in App Center under the My Apps tab. To start the application, click Open under . QNAP Express is a physical storage shipment solution that helps in backup and retrieval of large amounts of data within a week. Within a week, transfer bulk data from your NAS devices to your online account. Data is protected using military grade 256-bit AES encryption, with optional private key, during data transfer and storage. Perform incremental backups, to keep your data safe from disasters, after initial data transfer. Zero bandwidth consumption during the data transfer process. The service is FREE once a year for Personal users and thrice yearly for Business users. Subsequent backup requests will be subject to a charge of $59.95. Express restores will be charged $99.50 per request. It includes free return shipping for customers within USA. Express orders shipped outside USA may have additional shipping costs. Upon placing the order, our team will provide a shipping quote that will be charged separately. 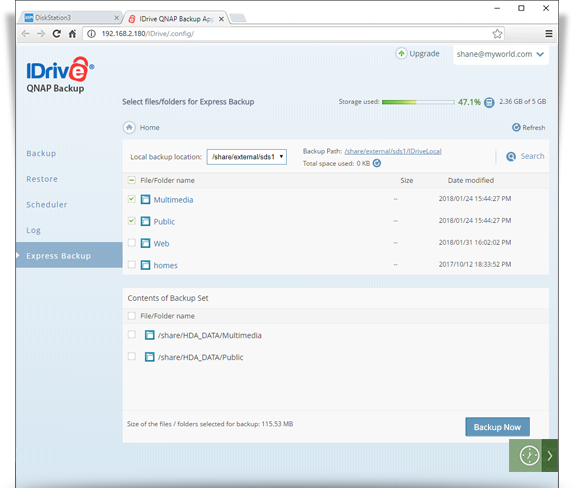 How does Express Backup & Restore work? Data is to be backed up to the device once you receive the express storage device. You send us back the device and we transfer your data onto IDrive's primary storage devices. You can safely retrieve all your backed up files and folders stored in your IDrive cloud account, to your NAS device, using the expres storage device. Easily perform instant restores with express restore.